Balloons add a sense of joy to any event. Children and adults alike are attracted to the bright colours and fun shapes. Shimmering orbs floating above a celebration give an air of festivity. Businesses use them to advertise and as souvenirs. However, many people have a wrong perception that balloons are bad for the environment. When balloons are handled properly, they are eco-friendly, starting with how they are made and ending with how they are discarded. Balloons are classified according to the material they are made of. Today, most balloons are made of rubber or mylar. Rubber or latex balloons are made from the sap of the rubber plant, hevea brasiliensis. 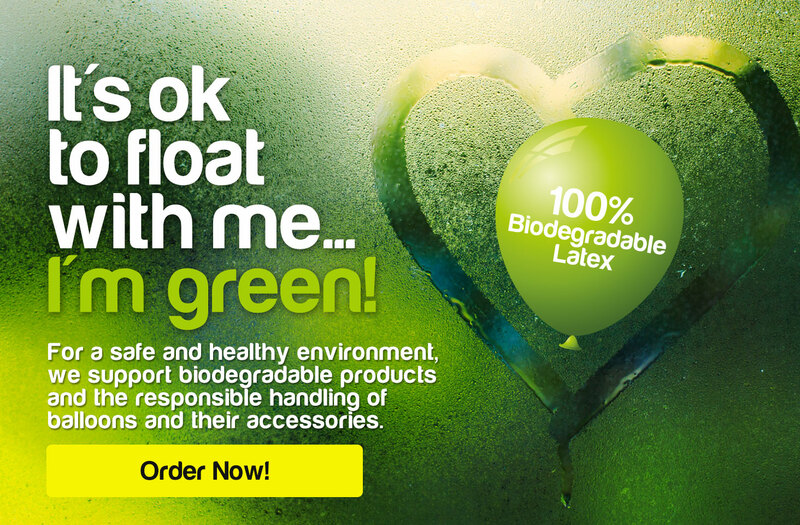 Latex is 100% biodegradable. The rubber plant is a tropical tree native to South America and now cultivated throughout the world. Rubber is extracted by collecting the sap from a live tree, which produces latex for approximately 25 years. A single rubber tree can offset 1 million metric tonnes of carbon dioxide during its economic lifespan. Mylar balloons, also known as foil balloons, are made from a polyester resin coated with a metallic foil for a decorative effect. These balloons however are not biodegradable. Both latex and mylar balloons can be inflated with air or helium gas. As we know, helium allows a balloon to rise into the air and because mylar is very thin and lightweight, it keeps its buoyancy for a long time, sometimes several weeks. The Balloon Council, a professional organisation formed to educate consumers about safe balloon practices, discourages the release of foil balloons into the air for both environmental and safety reasons. When latex balloons filled with helium are released into the air, the gas expands, allowing them to soar as high as 28,000 feet above the earth. At this elevation, the air temperature is minus 40.5 degrees C. The balloons freeze and shatter into small pieces that fall back to earth. If a balloon does not burst, it’s carried in the prevailing wind until conditions allow it to descend. Exposure to water, sunlight and soil cause latex to break down at approximately the same rate as an oak tree leaf and faster than a piece of wood. The process of decomposition starts at the time the balloon is made. After a latex balloon is inflated, it develops a patina, which is oxidation of the latex. After a balloon pops or deflates, it degrades just like any other organic substance. The rate of decomposition depends on the conditions of exposure. A controlled study demonstrated that under most conditions, latex balloon pieces are almost completely degraded in about six weeks. However, any attachments to balloons, such as ribbons and strings, may not have the same properties as latex. For many years, people have celebrated events with balloon releases. Although balloon releases are spectacular to watch, there are concerns about their effect on the environment. The hundreds of balloons released simultaneously must eventually descend, but there is no way to control where the pieces land. Some governments and councils have blanket banned balloon releases to protect the environment. However, latex balloons, released according to guidelines issued by balloon industry organisations have little effect on wildlife and the environment. Balloon drops are an alternative to balloon releases. Balloons filled with air are placed in net high in the air in a controlled environment and released, dropping to a target area below. After falling to the ground, they can be gathered and disposed of responsibly. What Are Smart Balloon Practices? The Balloon Council and other professional balloon organisations throughout the world have issued guidelines for safe balloon releases. This includes using only latex balloons, limiting the number and size of balloons, hand-tying knots, not using strings or ribbon and launching single balloons instead of clusters. Foil balloons should not be used in balloon releases. Foil balloons filled with helium should have weights attached to prevent them from escaping into the air. After use, balloons should be cut above the knot and placed in a dustbin. Responsible balloon retailers adhere to the Balloon Council’s guidelines for Smart Balloon Practices.